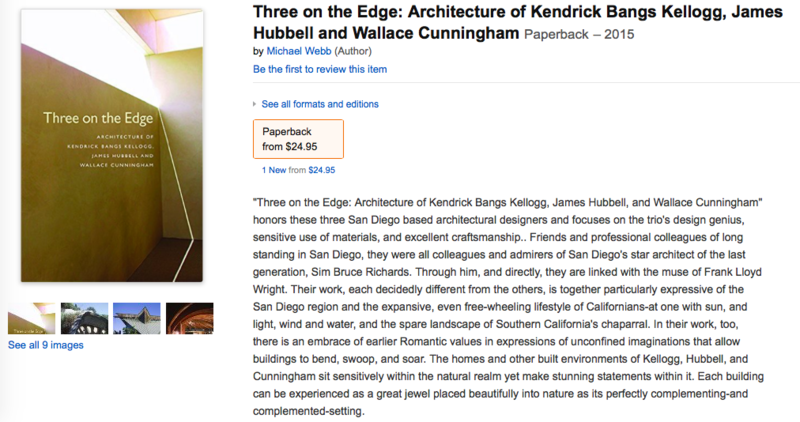 Excerpt from "Three on the Edge"
…At age twenty-three, Kellogg designed the Babcock House in South Mission Beach- as startling an apparition among its neighboring cottages as is Rudolph Schindler’s Lovell Beach House on Balboa Island, which was completed thirty years earlier. The Babcocks had originally wanted a house by Wright, but they gave an untested talent a free hand to create his version of an A-frame house. As architect Kay Kaiser has noted in a masterly essay on Kellogg, the house’s soaring wooden prow evokes the architecture of Polynesia- a theme popularized in the late 1940’s by the publication of Thor Heyerdahl’s Kon-tiki Expedition- but there are also echoes of Wright in the repeated triangles, as well as traces of Bruce Goff.